OK, I’m sure not all of you missed this. If you caught it and feel offended, then…I don’t know, that’s something you need to work out on your own. I’ve already reviewed the film in length, so if you haven’t seen Age of Ultron yet and want to avoid even mild spoilers, you can check out my spoiler-free review and come back here when you see the film for yourself. Long story short: it’s a good movie worthy of its place as an Avengers sequel. While I enjoyed the film, I had a few complaints in regards to some of the character and narrative development. Specifically, I disliked how “rushed” the first act was in terms of establishing Ultron as a villain. When you watch the movie, you’ll notice that we sort of jump into this plot (which isn’t heavily related to the opening scenes) with Tony Stark suddenly revealing to Bruce Banner that they can create an artificial intelligence. After a brief montage (seriously, a montage), they succeed in using the gem inside Loki’s scepter to create an A.I., though they leave before realizing Ultron has been created. I’ll spare you the details on what happens next in case you haven’t seen the movie yet, but the short version is that Ultron as a villain is born over the course of about ten minutes. I didn’t like this because I felt like such a crucial part of what makes Ultron, well, Ultron was glossed over for the sake of getting right to the action. A noble goal, but for a movie that’s 2.5 hours long, I would have preferred just a few more scenes to familiarize us with Ultron’s motivations. Honestly, though, this is all nitpicking, especially since the 3-hour long director’s cut will likely fill in the blanks in a more satisfying way. Now on to what you may have missed. See, I’ve been thinking a lot about Ultron’s personality over the last few days. As a villain, he has a compelling spark to his tone and delivery that makes him seem more like a misguided anti-hero instead of an instrument of pure evil. I realized that this is explained in a very subtle way near the beginning of the movie. Ultron was essentially created by Tony Stark and Bruce Banner. They’re like his parents, and in an amazing way, Ultron inherited the best and worst traits of these parents. Ultron is sarcastic, impatient, and brilliant. Much like Tony Stark. He’s also prone to violent outbursts, like Bruce Banner. Most of all, Ultron has a specific vision for the world (like his fathers) and has the strength and will to carry it out. The only problem seems to be something that is later fulfilled by a character I won’t spoil. Obviously, this is intentional on the part of Joss Whedon and his team of writers. When crafting Ultron as a character, it must have seemed perfectly natural for them to borrow from established characters, so we would familiarize ourselves with Ultron quickly and immediately feel threatened by his claim on the world. 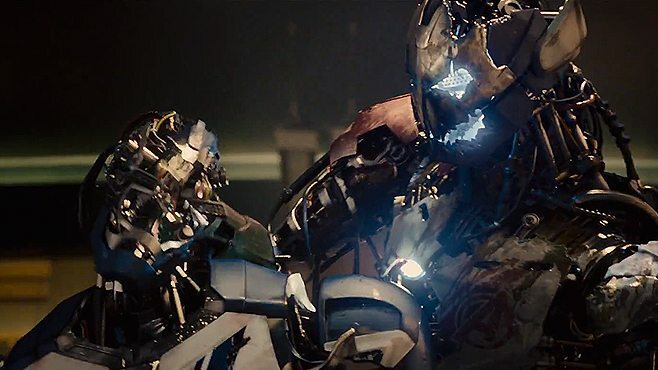 The father-son dynamic is reflected several times in the movie later on, of course, as Tony banters with Ultron over the fact that he’s his maker. This film would have been so much better, in my opinion, if they had just given Ultron a little more room to breathe in this way, so more audience members could catch that he’s a product of this world created by the Avengers (not just the literal Avengers themselves). After all, facing themselves is a sizable threat that the Avengers would (and did) have to face, even though the movie sort of sidetracked in that regard. Now, in case you were hoping for some easter eggs, I can at least give you a few morsels to chew on. I didn’t notice as much as some other Marvel fans, but I did catch something related to Tony Stark and J.A.R.V.I.S. When Tony has to find another program to help him fight Ultron, we see him settle on “FRIDAY.” In the comics, Tony uses FRIDAY as his virtual personal assistant, and she is very similar to Ultron in that she’s like his child. Remember that Ultron wasn’t actually invented by Tony in the comics, so Marvel was clearly introducing FRIDAY as a subtle nod to the origin story they gave to Ultron. I’ll have to watch the movie again, but I’ve also heard that Jocasta’s name can be seen around the same time Tony grabs the FRIDAY program. I can’t confirm this yet, but that would be an interesting easter egg considering Jocasta was created by Ultron to serve as his robot girlfriend (though she later becomes an Avenger). That’s all I have for you guys. Hope you enjoy (or enjoyed) Avengers: Age of Ultron. Again, if you want my full review on the movie or just want to know my thoughts on it, you can check that out here. Dang. I didn’t catch any of that. Yeah I definitely need to watch this movie again. I agree, the creation of Ultron as a villain felt a bit rushed for me as well. But never the less, I LOVE this villain, probably my favorite so far from the MCU (sorry Loki). He is, like you said, a combination of both Tony and Bruce, though I think Tony is more prominent. One of the things I love about Ultron is the complexity of his character, and I couldn’t help but find myself a little sympathetic towards him (for reasons that I’m not going to spoil here for those who haven’t seen the film yet). For that reason alone, I want to watch this movie again :). Oh, and he’s played by James Spader. That’s a HUGH bonus!